At 11.30 we all help to put the toys away and gather for a singing time. You are welcome to stay and eat your sandwiches in the hall as long as you clear up afterwards! Photographer - once a year (usually in October/November) we have a visit from a professional photographer who takes individual photos of the children for you to buy if you wish. Ideal Christmas present! Christmas parties - our last sessions before Christmas take the form of parties with songs, simple games, food and a visit from Santa! 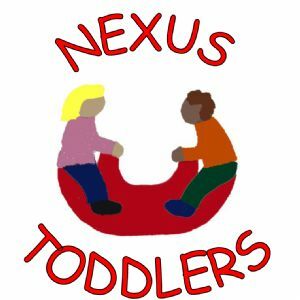 Babies & toddlers (4 and under) with their parents or carers. We do not have a waiting list but we ask you to fill in a form with your contact details when you first come. £1.50 per session per family. This includes coffee, tea, squash & biscuits. Baby-changing/disabled toilet with potties provided! Kitchen with microwave for heating bottles, etc. The group is run by volunteers from Nexus Methodist Church. Please ask us if you need help with anything during the sessions or if you would like to know about other church activities, including holiday clubs for older children. If you are able to help with setting up or clearing away, or would like to volunteer to organise a simple craft, please speak to one of the helpers. We have a 'birthday cake' with candles and sing 'Happy Birthday' to any children with a birthday that week. Please let us know if it's your child's birthday! The hall is also available for hire for children's birthday parties (and other meetings or social occasions). Regular members of the group are welcome to use our toys. Ask any of the helpers for details or email here. We meet in the hall of Nexus Methodist Church at Walcot. Access is via the side door, down the path to the right of the church as viewed from the front. Please ring the doorbell marked 'Toddler Group'. See the Find Us page for a map and more details.